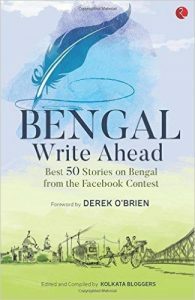 Derek O’Brien forewords the anthology titled Bengal Write Ahead . The book is edited and compiled by Kolkata bloggers and is a part of the contest held by Facebook in partnership with Rupa publications,Kolkata Bloggers and RED FM. A collection of fifty stories that speak about various facets of Bengal. Each story in the book is unique and poignant. There is a sense of belonging and love in each story. The land of literary geniuses is discussed in great detail. It is amazing that one of the stories discusses LGBT rights and how forward Bengal is in that matter. The words seemed to have just flowed out of every writer as a strong emotion, fierce. The fifty stories sums up the best of West Bengal. I have visited Bengal on various occasions and the city of Kolkata always amazes me. Like many other cities Kolkata reminds me of the good memories and good memories only. The book discusses every positive aspect of the state. The cover of the book lured me into devouring it. A beautiful water paint of a quill, the tram, Howrah bridge and the famous Durga puja. Every story is highly descriptive in nature, similar to Amitav Gosh’s work. Keen eye for detail. While one story claims that Bengal has always been the hub of Indian football while another describes Park street and the city of joy ,as of how the place speaks for itself. The book is filled with anecdotes from people from all walks of life. Cinema,art,writing,shopping,landscape, cuisine and sports, the book evokes an emotion. The stories speak about the past that has shaped their present. Most of all that I liked in the book was that it had the capability to make you laugh, cry and hit nostalgia all at the same time especially if you are a Bengali. The book is a feast to bibliophiles who know to read Bengali as well. After you finish half of the book, the stories become repetitive, with a unique personal touch of every writer that doesn’t make the read boring. Simple language and good editing makes the book a pleasant read. Connecting the post to Day 6 of#Halfmarathon by Blogchatter.